Dozens of books currently available address some aspect of digital television, yet almost all of these texts deal exclusively with engineering and production issues associated with implementing new hardware and software. Digital Television: DTV and the Consumer offers a pragmatic, more socially oriented basis for understanding digital television. 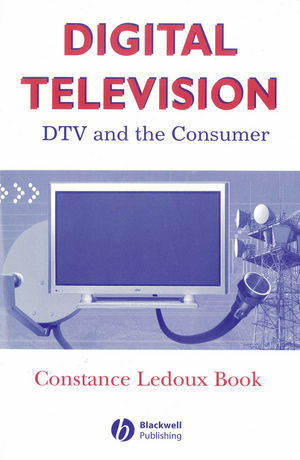 Beginning with a basic summary of how digital television works and how it evolved into its present state in the different television viewing environments (over-the-air, cable and satellite), author and researcher Book then offers the reader a more practical understanding of how digital television is currently being consumed in the household. Additionally, the text presents a summary of what consumers are saying regarding their digital television experience and what this data suggests for the future development of digital television business models. Unique to this volume are numerous Innovator Essays by some of the industry’s digital television pioneers. These insightful essays – from significant DTV innovators such as Jim Goodmon, president and CEO of Capitol Broadcasting, home of the first commercial digital television broadcast – give brief snapshots of critical moments in the transition and rollout of DTV, while focusing on what the future holds for consumers and the broadcast and electronics industries. The latest entry in Blackwell Publishing’s Media and Technology series, Digital Television: DTV and the Consumer provides media students, scholars, and professionals a compelling perspective of the social and cultural presence of this emerging technological phenomenon. Constance Ledoux Book is Assistant Professor in the School of Communications of Elon University, Elon, NC. Additionally, she serves as a consultant in digital television and cable communications, policy and regulation and has been lead researcher on cable television and other technology in numerous municipalities including Detroit, Denver, Milwaukee, Lincoln (NE), Seattle, St. Paul (MN), Danbury (CT) and Montgomery County (MD). 1. America’s Transition from Analog to Digital Television. 2. A History of Digital Television Development in the United States. 3. Re-examination of Public Interest in a Digital World. 4. Educating Consumers about the Digital World. 5. The Living Room Test: Early Consumer Response to High Definition Digital Television. 6. Cable Television as a Platform for Digital Television. 7. Innovators and Early Adopters of Digital Television. 8. Public Television’s Transition to DTV. 9. Mixing the Television and the Computer, PCTV or TVPC?. 10. Looking Ahead at an ATSC World. Index Ahead at an ATSC World.